Over the next 7 days, Kinna Reads, a leading African lit blogger, is hosting the 2nd annual Ghanaian Literature Week. This year’s reading event started Monday, November 14th and will run till Sunday, November 20th. I read a slim picture book that's been tucked away since I bought it at the Baltimore Book Festival. 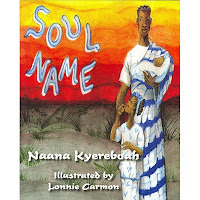 Soul Name by Naana Kyereboah, a children's writer and teacher based in the United States, touches on an important aspect of Ghanaian life: Every name has meaning and character. 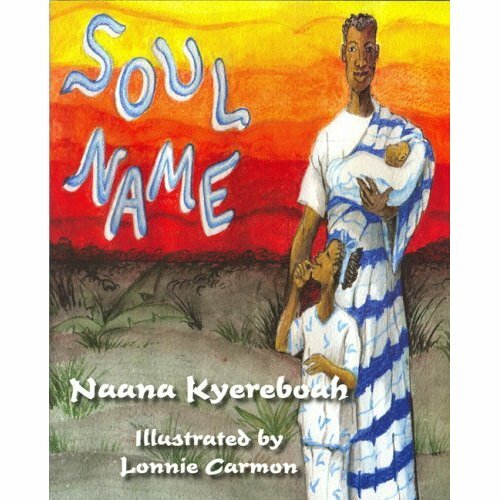 Published in 2007, Soul Name (Nabina Publications) is about a young girl and the journey she takes us through a remarkable naming ceremony for her one-week old brother. Soul Name is about an eight-year-old Ghanaian girl, Ekua, who invites you to join her and her family in the naming ceremony for her brother, Kofi. Ekua shares with us why the naming of a child is very important... The given name, which is revealed by the father for the first time at the ceremony and carefully chosen from his family, links the child’s life with the past, the present and fashions his future: it embodies character. The reader peeps in on the naming ceremony through Ekua's eyes and at the end is welcomed to figure out one’s soul name.